Football. Euro 2020. Qualifying stage. Group round. As we may all recall, Belgium performed fairly well at the last 2018 World Cup in Russia (the team reached the semi-finals where they lost to France). The Belgians have also had good results in the first group drawing of the League of Nations. Roberto Martinez’s squad were not able to take first place in their group as they conceded the position to the superb Swiss team only on goal difference. 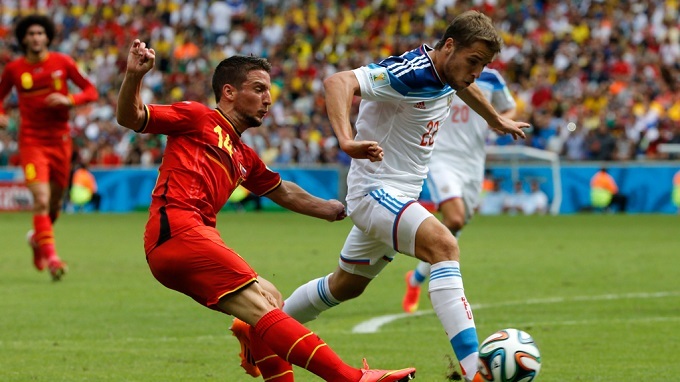 As for the game itself, the Belgians play well in attack, but with one caveat. Unfortunately, the Dragons often have difficulties scoring in matches with competitors such as Russia, who generally like to practice tactical football. At the same time, it should be noted that the Belgian national team also plays quite reliably in defence, especially in home matches. In this case, Belgium’s home field advantage results in a significant disadvantage for the visitors. The Russia national team also had a surprisingly successful World Cup, reaching the quarterfinals, the team’s best World Cup result in its history (tied with the USSR in 1966). However, Cherchesov’s team did not perform well at the League of Nations. Russians took second place in the group preventing them from moving past the group stage in group A with stronger opponents. Stanislav Cherchesov called all possible key players such as Artyom Dziuba and Denis Cheryshev for the next qualifying match, as he is well aware of how difficult the upcoming battle will be for the Russians. A cohesive defensive is most certainly Russia’s strong point. Most likely their success in the previous World Cup can be largely attributed to their unequivocally reliable defensive tactics. However, the Russians generally have great difficulty scoring against stronger opponents. The last two matches against Germany (3:0) and Sweden (2:0) confirm this thesis. Belgians find it difficult to score goals in matches against “tactical” opponents such as Russia. Russians have rather weak attacking actions. The result of this match is of great importance for the two teams. Therefore, both Russia and Belgium will play extremely carefully. Considering all pre-match deals, we do not expect a high-scoring match, which is absolutely suitable for our bet.